Chrysler and Liberty Dodge Chrysler Jeep RAM are proud to offer a special incentive for our military. Read on below to learn more! European settlements were first established in the area of Fort Stewart as far back as 1733. In 1996 the 3rd Infantry Division was activated at Fort Stewart, beginning a new chapter in the base's history. Today, Fort Stewart is the largest Army installation east of the Mississippi River, covering 280,000 acres. It is also one of the Army's premier installations and has earned the Army Community of Excellence Award an unprecedented six times in 2004, 2005, 2006, 2009, 2012, and 2015. Fort Stewart and the city of Hinesville together make up the Hinesville-Fort Stewart metropolitan statistical area. Liberty Dodge Chrysler Jeep RAM is just a few minutes from Fort Stewart! We invite all residents of the base to enjoy our convenient location, top customer service, and incredible selection of new and used cars, as well as service and repair you can count on! Are you an Active, Active Reserve, Retired Military, Retired Military Reserve or are an honorably discharged veteran within 12 months of discharged date? Liberty Dodge Chrysler Jeep RAM, along with FIAT Chrysler Automobiles (FCA), is proud to offer you our Military Incentive program. 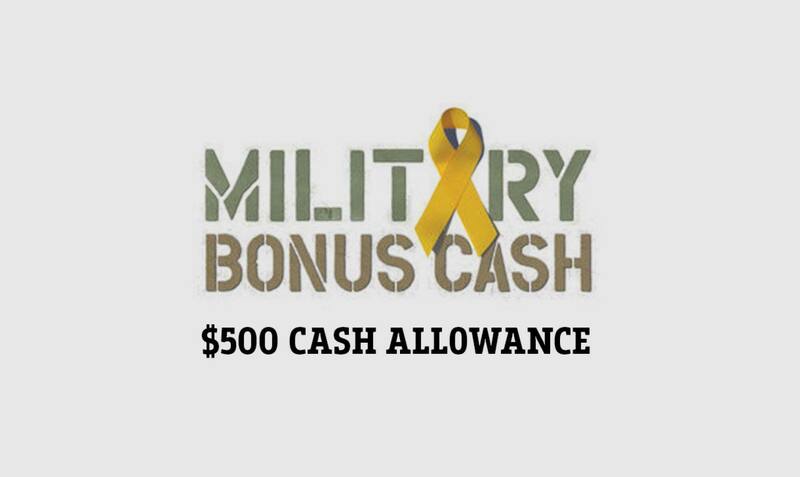 This great program makes you eligible for up to $500 in Military bonus cash! This special offer applies to purchases and leases of new FCA US, LLC brand vehicles. Whether you are in search of a RAM truck, Jeep SUV, Dodge SUV, car, or minivan, or Chrysler car or minivan, we welcome you to take advantage of this fantastic deal if this applies to you or a loved one! If you are searching for your next vehicle, you are likely considering your finance options. We invite residents of Fort Stewart to meet with our finance staff. They will work with you on an individual basis and come up with a financial solution that assures you can get an affordable loan for the perfect car. With helpful financial professionals on hand to assist you, we at Liberty Chrysler Dodge Jeep can get you a loan that fits your budget without the stress. We look forward to assisting you and instantly approving your loan! If you have got a problem with your vehicle, then bring it by and let our talented mechanics diagnose and fix the problem. Folks living in Fort Stewart can also seek us out for the certified parts they need maintain their vehicle. If you'd like to schedule an appointment with our service staff you can do so by creating a vehicle service appointment here on our site.